Reset Stone and Reset Stone Box are not available to exchange, drop or put in the cart, but you be able to put them in your storage. 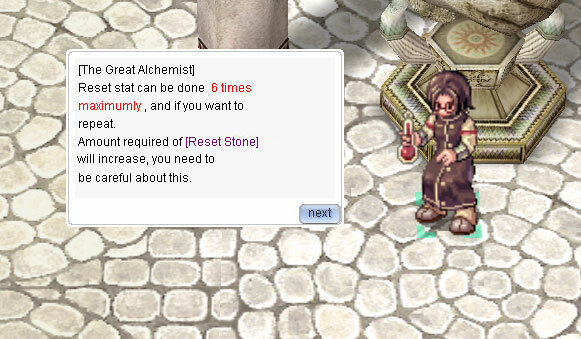 A character can reset the status up to 6 times maximumly. You also have to unequip your cart / Peco Peco / Falcon from your character first. 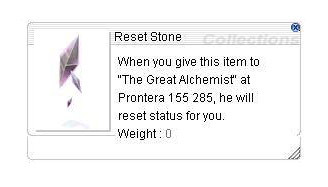 Go to NPC "The Great Alchemist” at Prontera 155, 285. Once you finished resetting, even you have the Reset Stone left, you have to wait for 20 hours before doing the reset again. The amount of Reset Stone required is different depending on the character’s level. The more your level, the more stones are required. you have to wait for 20 hours before doing the reset again. The amount of Reset Stone required is different depending on the character’s level. The more your level, the more stones are required. and want to reset your status for the second time, you have to use 3 Reset Stones. 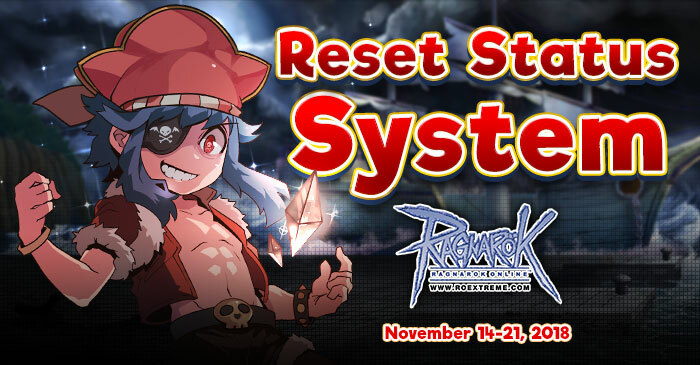 NPC Reset Status will also be removed from the server on November 21, 2018. Reset Stone and Reset Stone Box are not available to exchange, drop or put in the cart, but you will be able to put them in your storage.